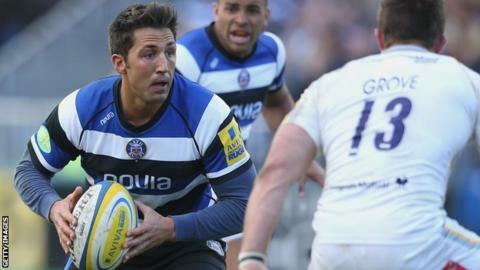 Bristol are aiming to bring Bath's Gavin Henson to the club before the end of the Championship season. The 33-year-old Wales international is due to make his move to Ashton Gate in the summer, after agreeing a one-year contract last month. But Henson has not played for Bath since November and Bristol coach Sean Holley says they want to integrate him at his new club as soon as possible. "The aim was to get him to play a part this season," said Holley. He told BBC Radio Bristol: "We're off that at the moment but it would be absolutely fantastic to secure his services at this time of year. What an acquisition he would be. "We're working hard on it. Wouldn't that be a coup if that happened? We'll just have to wait and see where we are with that." Utility back Henson arrived at Bath from London Welsh in the summer of 2013 and has made 15 starts and 19 appearances from the bench. He played 10 games before picking up an injury in November and has not been able to regain a place in Mike Ford's side since then. "He'd light up the Championship and Ashton Gate," said Holley, who worked with Henson during his time at Ospreys. "He's a huge talent and has huge presence, aura, and can really lift the squad."